"The Butterfly Lovers", Concerto for Violin and Orchestra. Composed by Ho Zhan-Hao and Chen Gang. 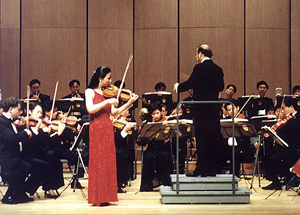 The Butterfly Lovers, composed in collaboration by Ho Zhan-Hao and Chen Gang for solo violin and orchestra, is one of the most popular pieces of recent Chinese music. 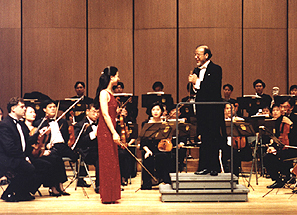 The following information about the work appears as a preface to the score: The Concerto for Violin Liang Shanbo and Zhu Yingtai, known outside China as The Butterfly Lovers, is a programmatic piece in one movement based on the story of the love of a young man and a young girl. The music draws on Shaoxing opera tunes. Its three sections recount three episodes characteristic of the story-love, protest and transfiguration. The exposition begins with a flute solo against a background of soft tremolo on the strings, followed by a beautiful melody on the oboe which represents a peaceful, sunny spring day. The solo violin, accompanied by the harp, sings a simple and graceful love theme and enters into a dialogue with the cello, which renders into music the first encounter of Liang Shanbo with the girl Zhu Yingtai at a wayside arbor. A free cadenza leads to a lively rondo, in which the solo violin alternates with the orchestra. Three happy years of close affinity pass quickly, and the two young students have to return to their homes. An Adagio utters their reluctance to part. The development opens with ominous foreshadows on the gong, cellos and bassoons. Brasses break in with a fierce and malicious theme, the them of feudal forces. the violin pours out first the anxieties of Zhu Yingtai in free rhythm and then her protest in powerful syncopated chords. The two themes-the protest theme and the feudal forces theme-are woven into a climax of conflict. Yingtai protests against an undesired marriage. In the Adagio that follows, a duet for violin and cello evokes the longing of Shanbo and Yingtai for each other when they visit in the girl's parlor. The music shifts abruptly into san-ban (free rhythm) and kuai-ban (fast tempo). Yingtai pours out her grief to the heavens at Shanbo's tomb after his forlorn death, The device of jin-la-man-chang (singing freely upon a rushing accompaniment), borrowed from Shaoxing and Beijing operas, ushers in another climax. After the violin finishes its last plaintive phrase, the whole orchestra bursts into a powerful tutti. The tomb opens, and in plunges Yingtai. The music swells to the largest climax of the Concerto. A rainbow shines and flowers flourish. In pairs that never sever. The spirits of Liang and Zhu never perish.